This is one of the coolest jumpsuits we've come across. Designed by Diane Freis in the 1980's, we love that her pieces are made specifically to fit on a wide range of sizes! This jumpsuit wraps in front and has an elastic waist. The wide legs have elastic at the cuffs, creating a ballooning effect. The legs are pleated with a different pattern of fabric inside the pleats, revealing the floral lattice only as the wearer walks! 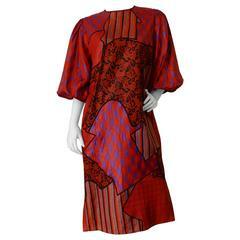 The pattern on this pink jumpsuit is an abstract cluster of reds, orange, blues and white. The waist and neckline have striped waves of these colors. The puff sleeves are 3/4 length with elastic at the end, and fabric florettes at the shoulders. From the florettes fall strings of the same material, creating bows with colorful beads at the ends. This is a great day dress alternative! Made of polyester and in excellent condition. We estimate this great jumpsuit to fit a modern day US size 4/6 but please see the measurements for accurate sizing. BUST: up to 42" (meant to be blousy) WAIST: 24"-36" HIPS: Free LENGTH: 61" SHOULDER to top of waist: 17" INSEAM: 29"